THIS ITEM IS NOT AVAILABLE AT PRESENT. WE WILL NOT BE GETTING ANYMORE Star Wars Millennium Falcon Micro Mini Dome Crossbody Purse. From the Star Wars collection by Loungefly. 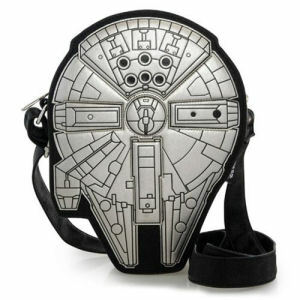 Star Wars Millennium Falcon Micro Mini Dome Crossbody Purse. nterior includes 3 credit card slots and 1 open pocket. Mini Dome Purse measures 6.5 inches wide by 7.5 inches tall by 2.5 inches. All Loungefly items are vegan friendly - unless otherwise noted.